You’ve probably heard the phrase ‘manspreading.’ It refers to that particular way men often sit, legs splayed apart, with little regard for the personal space of others nearby. It’s a worldwide phenomenon. Madrid public transportation officials are targeting the practice, with a new campaign that seeks to dissuade passengers from spreading their legs. “The mission of this new signage is to remember the need to maintain civic behaviour and to respect the space of everyone on board the bus,” said Spanish bus operator EMT. The city's Metro system will adopt a similar campaign as well, according to BBC News. The decision to put up the signs came about after the women's group Mujeres en Lucha had organized a petition pushing Madrid officials to do so. Men could argue that there are parts between their legs that make a knees-together posture uncomfortable. But even this (male) Open Jaw writer will admit that this may be a bit of a fish story, if you know what I mean. The Mujeres en Lucha group also posted and retweeted photos of public transportation offenders on its Twitter account. 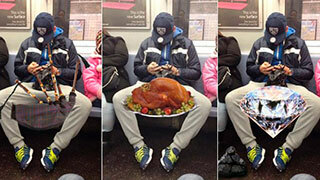 In one instance, it Photoshopped imaginary items that might fit in the space between a manspreading passenger's legs, including bagpipes and a Thanksgiving turkey. For those who manspread, it can barely register that they're sitting in a way that they irritates others — or perhaps they simply don't care. For those who loathe the practice, (and it’s often a gender line split) it's immediately recognizable. Madrid is not the first city to try to discourage manspreading on its public transportation. A 2014 Metropolitan Transportation Authority campaign sought to crack down on manspreading on the New York subway system, when it adding an image of an offending passenger to a series of posters about general common courtesy on public transportation. The same thing happens on airplanes, where it becomes less of a gender issue and more of a knee-knocking battle for space. That could become the next front in the battle.